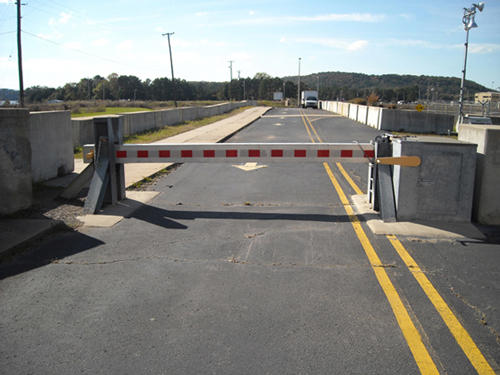 Nasatka Steel-Plate Barriers are the most proven, tested and reliable vehicle-access control barrier systems in the world. They are a perfect combination of engineering achievement, durability and security. Absolutely no substitute comes close to the advantages offered by Nasatka Security’s Steel-Plate Barrier Systems. Nasatka has engineered three versions of the Pop-Up Steel-Plate Barrier to meet the Department of State and U.S. Army K12/L3 (15,000 pounds @ 50 mph) crash certifications: no housing, single housing and double housing. Nasatka Steel-Plate Barriers feature hot dipped galvanized steel construction (the only manufacturer with this as a standard option) providing lasting durability and protection. Nasatka pre-assembles all models to precise specifications. Installation is as easy as trench, mark elevations, set to elevations and pour. Our self-contained buttress with surface-mount, steel-plate, barrier design greatly simplifies installation, reducing both initial installation costs and long-term maintenance requirements. Barriers may be anchored to a foundation by cast-in-place or by being bolted onto an existing concrete pad. There are minimal excavation requirements for cast-in-place models – 16 in. Nasatka offers the industry’s most compact and operator efficient Hydraulic Power Units (HPU). NMSB III D Remote HPU minimizes corrosion by submerging the operator components within a 30 gallon drum of biodegradable fluid, easily protected by a weather resistant three cu. ft. enclosure. For clients that desire a green, energy efficient solution, Nasatka Security offers an all-Electric Power Unit (EPU) version the III-D using a Moog linear actuator. Moog has been an innovator in the motion control industry since the early 1950s. Single or Dual-Housing systems are available with all-electric or electro-hydraulic operators. For hydraulic operators, there are no external hydraulic lines or exposed electrical parts. These systems are “plug-and-play” in that all they require is a power and control wire to operate. All HPU housings meet NEMA outdoor standards. Manual operation of most models is supported without alternative electric power or hydraulics. Battery back-up and alternative energy, such as solar, is available on some models. A left and right self-contained housing is attached to barrier plates to hold the HPU(s) or EPU(s). Tamper-resistant, manual operation is provided via a spring-loaded, counter-balanced manual lift bar system. An optional traffic light and gate-arm located within barrier plate housing unit enclosure can be pre-assembled as a singular unit. Housing units may be recessed into the fence-line or curbside without obstruction to roadway access. They are available in both bolt-down and flush-mount, cast-in-place installation types. Tamper-resistant, eased manual operation is provided via a spring-loaded, counter-balanced manual bar deployment system. An optional traffic light and/or gate-arm can be integrated within the barrier-plate housing unit enclosure as a pre-assembled singular unit. The housing unit can be recessed into a curb, island or fence-line to remove any obstruction to roadway access. This model is available via either bolt-down or flush-mount, cast-in-place installation. This model is a flush-mount, barrier unit that operates via a remotely located HPU or via a linear actuator/servo EPU system. A remote HPU minimizes potential corrosion by submerging the operator components within a 30 gallon drum of biodegradable fluid, entirely enclosed by a weather resistant HPU enclosure. This model provides no obstruction to roadway access. Manual operation of a HPU-based barrier requires a hydraulic hand pump. Manual operation of an EPU-based barrier requires a UPS battery backup system; however, the barrier can be manually lowered via a manual brake switch located near the barrier. Nasatka’s surface-mount steel-plate barrier systems use a monolithic, hot-dip galvanized steel plate, delivered as single pre-assembled unit. Nasatka is the only barrier manufacturer to provide its entire product line with hot-dip galvanization as a standard feature, adding years to the life of your barrier. Utilizing the latest technology in the design of the Nasatka proprietary compact HPU and a real-time microprocessor based electronic control system, Nasatka Security’s solutions provide impeccable performance, reliability and maximum safety and security unrivaled in the industry. Relays and timers control Nasatka’s barrier systems, with optional, easy-to-operate manual controls. Nasatka’s barrier systems can be integrated into any type of access control devices, on-site or off. Prior to delivery, each barrier system is 100 percent factory tested and adjusted for normal installation operating conditions.